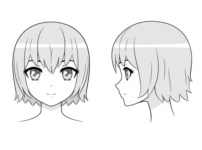 This step by step tutorial explains the specifics of drawing female anime and manga style eyes and provides detailed drawing examples for each step. This tutorial focuses on drawing female anime eyes but there are many other eye drawing tutorials here on AnimeOutline as well. If you’ve already looked at those please be aware that there may be some overlapping information. Anime eyes are almost always drawn bigger and wider than real eyes. 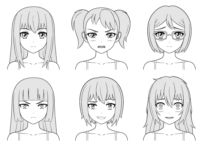 This is especially so for female characters who often have larger and wider eyes than their male counterparts. One thing that really sets female anime eyes apart from male are more prominent eyelashes (longer, thicker, and more of them). This is not always the case but it does tend to be so. 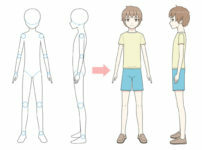 Be sure to make light lines for the line drawing part of the tutorial (if drawing on paper) as you will need to do some erasing through the different steps. You can go over your drawing with a more solid line once you are done. 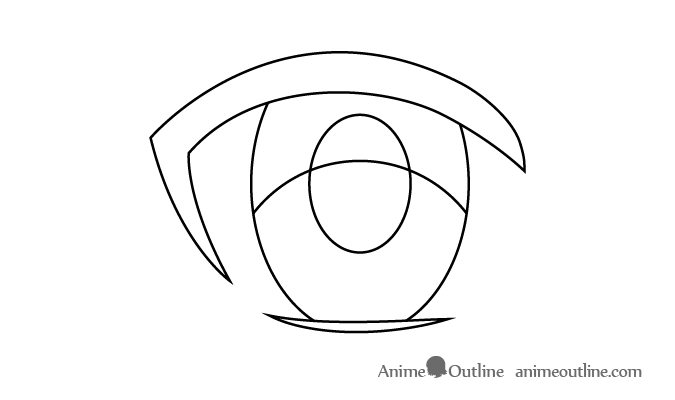 Start the drawing with the outer shape of the eye. In this case the eyelids. Draw the iris vertically stretched (compared to a real eye). Basically an oval with the top and bottom hidden by the eyelids. Inside the iris draw the pupil tracing the shape of the iris but smaller. Make a line towards the upper half of the eye that will indicate the darker area partially created by the shadow and the eyelashes reflecting in the eyes. 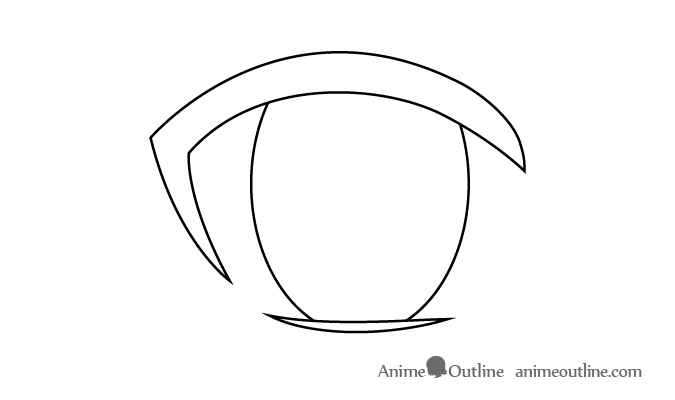 You can erase the line overlapping the pupil in the next step. The reason for drawing it all the way though like that is to make sure that both sides match up and that you have a nice and smooth curve. Draw the main reflection area from the main light source such as an indoor light bulb, a fire, or the sun. You can erase the area of the pupil and shadow that is overlapped by the reflection. The shape and color of the reflection can depend on the shape and color of the light source. 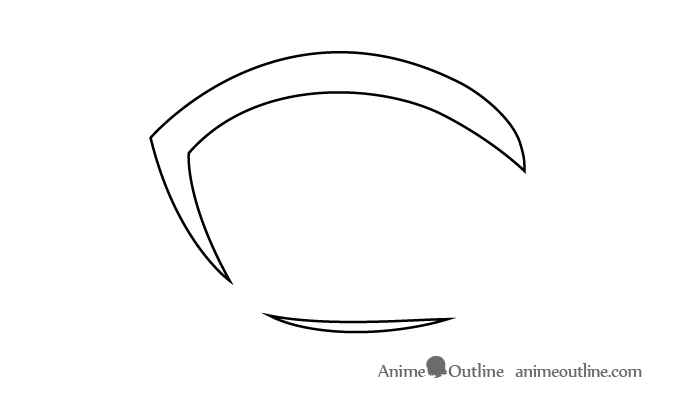 Usually in anime you can simply leave the reflection white and give it a very generalized shape like a circle or an oval. This reflection will usually come from the light of the main light source bouncing off of a surface and will be smaller than the primary reflection. Again erase the part of the pupil overlapped by the reflection. 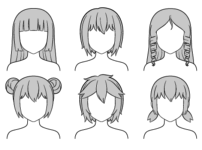 Finally you can shade the different areas drawn in the previous step. If drawing on paper simply leave the reflections white. Shade the eyelids which are also technically part of the eyelashes black. Shade the pupil black as well. Finally shade the iris grey or any color you want the eyes to have. 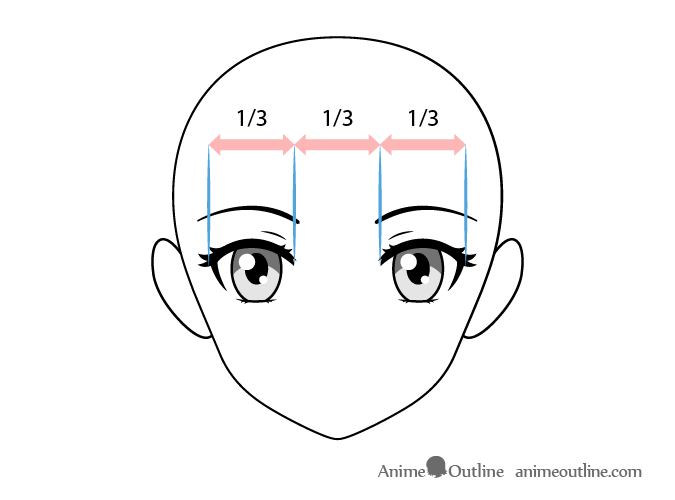 It should be noted that you could stop at step seven of this tutorial and have a perfectly normal anime eye but since the tutorial focuses on female eyes we will add some eyelashes. The first place you want to add the eyelashes to is the outer corners of the eye. 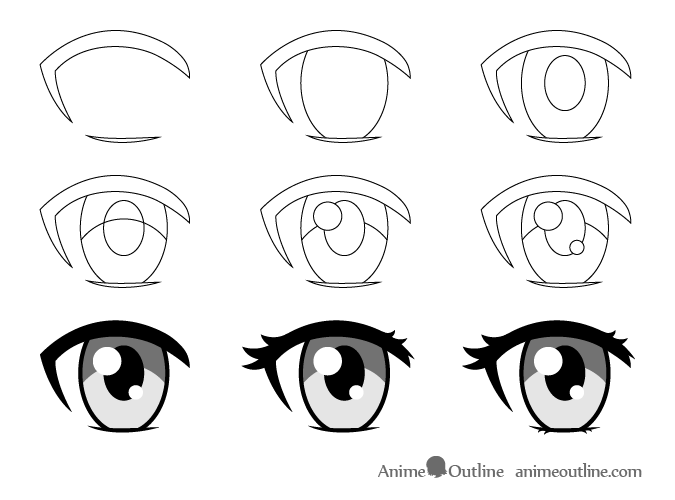 Generally eyelashes (real eyelashes) sort of fan out around the eyelids so you can draw anime eyelashes in a similar way. Next add some smaller eyelashes at the inner corner of the eye. 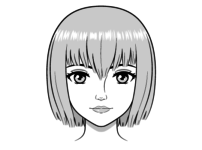 Since the eyelashes are fairly small you can also shade them as you draw them. There is no need to add any in the middle as these usually tend to point forward and therefore visually sort of just merge into one shape. Finally add some tiny eyelashes at the outer and inner bottom corners of the eye to have a finished drawing of a female anime eye. 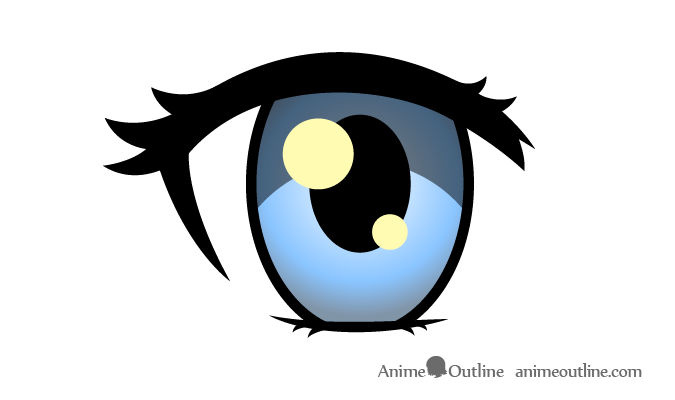 You can also color the eye instead of just shading it with greys as well as add some gradient. 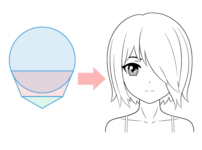 For gradient you can shade the iris to be darker towards it’s outer edges and lighter towards the middle. 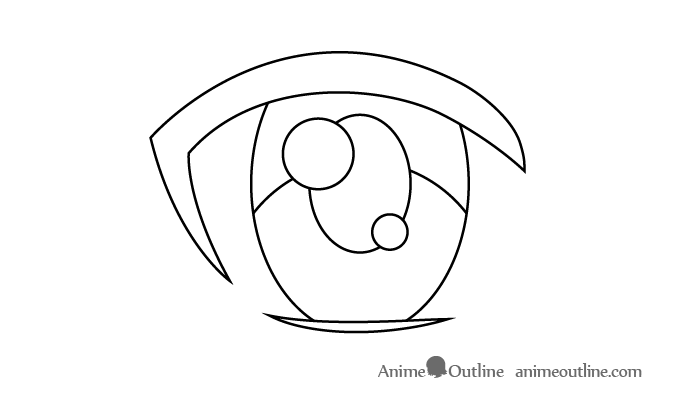 If you are drawing both eyes at once draw out each step for each eye before moving on to the next step. Another thing to note is that the light reflections will not be mirrored and will be in the same positions in both eyes. 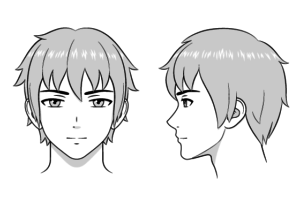 To place the eyes on the head vertically divide the head into two and draw them below the middle halfway point. 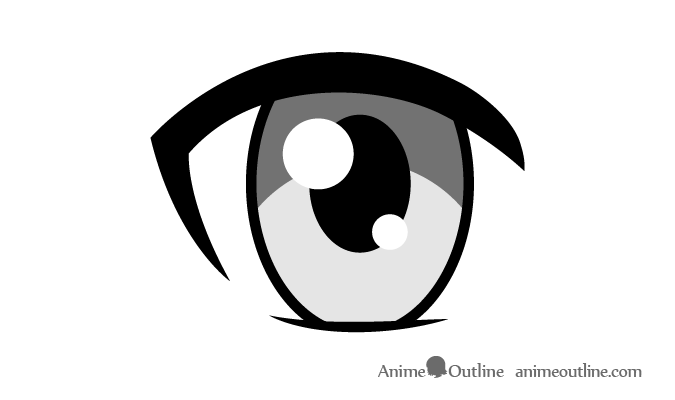 Please note that real eyes are usually positioned directly on this line but in anime eyes tend to be drawn lower down on the head. Especially so for younger female characters. To place the eyes out you can simply leave a distance of the width of one eye between them.